I feel very lucky to have friends here in Dubai with a lush dates palm garden. I recently was invited at their place to join the family for Iftar. 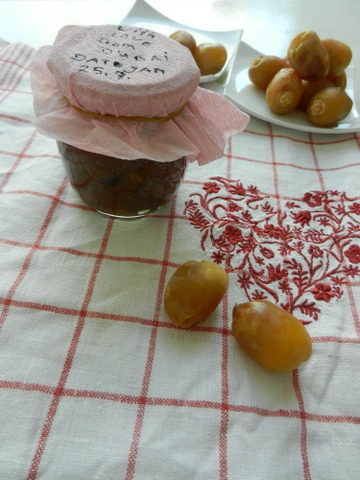 And look what I walked away with – packed with dates from their garden. So nice! There is also delicious home made dates jam and lovely arranged platters of different dates which I had to promise to bring to my mother when I fly to Bavaria soon! The shiny yellow dates are my new favorites: Their flesh is similar soft as a very ripe Khaki fruit and their sweetness is incredible. Like pralines with date ganache filling. In the hot summer season I am always delighted by refreshing yet nourishing and wholesome dishes. Being blessed with a new batch of dates, I went through my recipes for another dates preparation to share with you. Below recipe is good to prepare in advance (think daytime fasting but prepare food to serve for Iftar after sunset). Especially for the smoothie I recommend to start 1 day ahead for the maceration. The composition has a great taste and the right balance of sweetness, rich soft and creamy textures, and a fresh citrus and rosemary flavor. I think this could make a perfect sweet treat for your Iftar. Ramadan Kareem. Bring the cream with rosemary stalks to a boil. Simmer the liquid on low heat for around 3 minutes. Remove from the heat and combine with the lime juice and zest, add honey to taste. Keep the liquid with the rosemary stalks for minimum 6 hours in the chiller to get optimum flavor. Then remove the rosemary and transfer the flavored cream either into an ice cream maker if you have one. Otherwise it works equally well to pour the cream into a container with a lid and keep it for couple of hours in the freezer. In this case you will blitz the frozen rosemary cream in a blender short before serving. When you make the cake preheat the oven at 170 degrees Celsius. Divide the eggs. Whip the egg whites with a sprinkle of salt; add 50% of the agave syrup or honey and then the egg yolks with the orange zest. Continue to whip until thick foam is achieved. Fold under the flour, baking powder, carrots and 50 % of the chopped dates. Transfer the dough into a buttered cake form. Bake the dough for around 20 minutes. You can do the cake check: It is ready when a wooden skewer does not carry any dough when you stick it in. Remove the cake carefully from the form and chill it at room temperature. Mix the remaining dates with cocoa blossom sugar, sprinkle over the cake and caramlize the surface carefully with a blow torch. Cut the cake in portions and serve with the iced smoothie on the side. 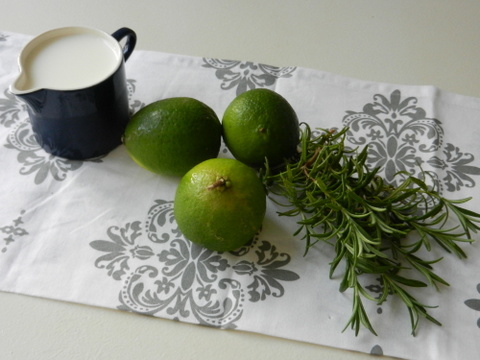 Read more about dates here and have a also a look what else to use rosemary for. Enjoy! 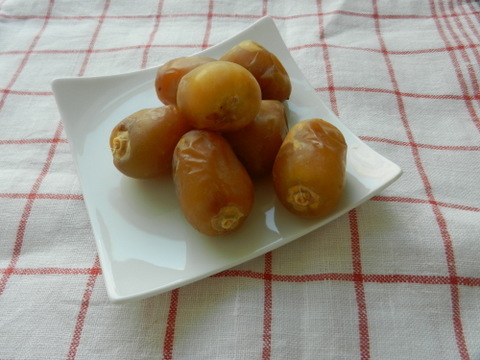 In summer the sweet fruits hanging from the palm trees are ripe – dates. 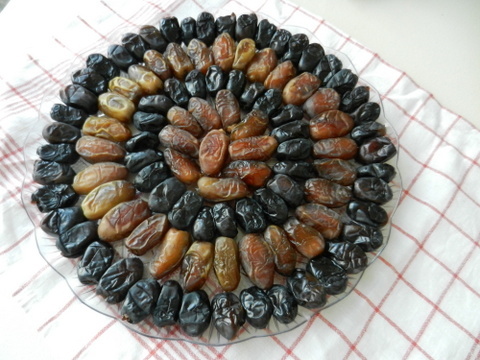 It is amazing, how many different types of dates exist! There are the ones that are ripe early, others come off the tree later. There are those that can keep for a while, where others have to be consumed fresh only. I still get lost over the variety, but trying to keep up. Here a few of the fresh ones I recently got. They do not keep for long. Each of them do not only look different, but also taste different! The red ones are crunchy like fresh apples, quite nice to snack on. 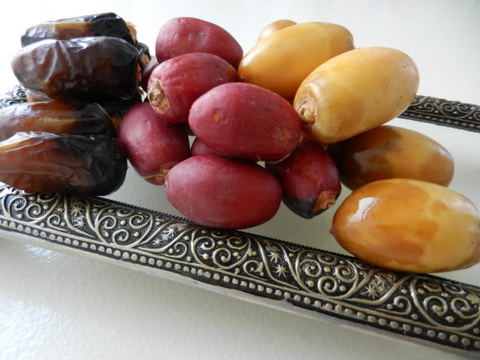 Dates have always been a staple food in the Middle East. Being a great source of dietary fibre and energy supplying carbohydrates, they are also packed with Vitamin C, several B Vitamins, and essential minerals. Some good reasons to eat dates regularly! 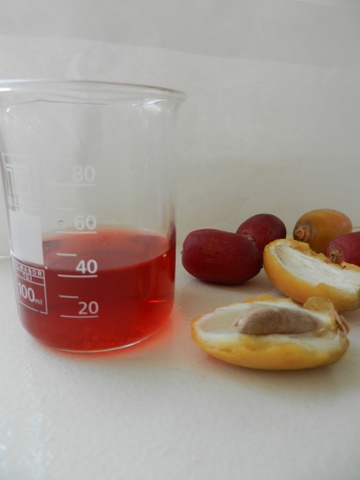 And this is not yet all: Another interesting fact is that dates kernel extract exhibits antiageing properties and is said to significantly define skin. 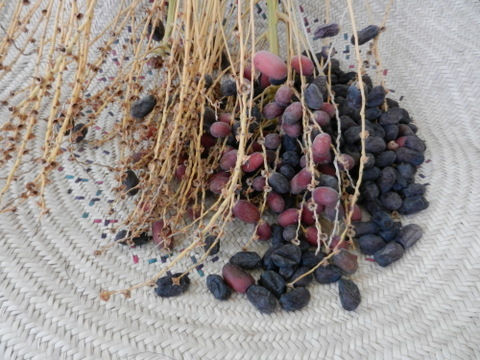 With the yearly big event around dates, Liwa Dates Festival, under way I share with you my personal approach to this signature fruit of my second home – simple, but culinary interesting. And unusual. So maybe I should have gone to Liwa to compete with the chefs….and, erm, win? 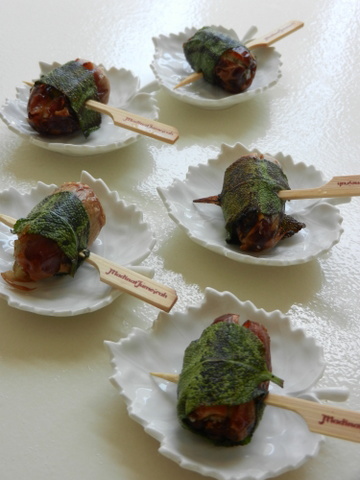 I stuffed dates with blue cheese (the French Fourme d’Ambert to be precise), wrapped each date in a large sage leaf, holding all together with a bamboo stick and braised them in olive oil. 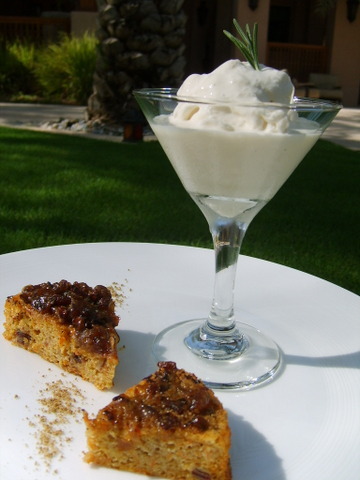 The recipe was featured in one of my cookbooks 2 years ago, and it is still one of my favorite savory preparations with dates. It can be served as snack, or as cheese dish before dessert. The way how the flavors marry and combine, is truly worth trying. Enjoy!